I spent my childhood weekends in the seats of Theatre Three in Port Jefferson, listening as my father took part in rehearsals for their perennial production of “A Christmas Carol.” It’s a play that I’d forgotten I know by heart, until I ventured out on opening night to Center Stage’s production of Joe Landry’s live radio play adaptation. The comfort of a familiar story is one that so many of us can take heart in during the stress of the holiday season, and this story is one for the ages — the tale of a man so enamored of money that he forgets his fellow men — with a sure fire shot at redemption, if only he will see the error of his ways. A Christmas Carol” has rarely been done on the East End, and this is a most welcome new holiday tradition here. Director Michael Disher’s gut instinct to tell this story through the incandescent glow of a 1940s radio set, complete with period costumes and Foley sound effects for all the audience to see, is a strong one, as is his cast, many of whom participated in this production in its inaugural year this past Christmas season. For a radio show, the most important thing is the voices, and this cast shines in that regard. Dr. Daniel Becker makes a thoroughly miserly Mr. Scrooge, while Richard Gardini is his perfect foil as Bob Cratchit. Barbara Joe Howard as Tiny Tim punctuates the story with bursts on innocent liveliness. The cast, disguised in radio actor names like Bunky Middleton, Harry “Jazzbo” Haywood and Sally Applewhite, also takes turns churning out harmonious jingles on the faux commercial breaks, while the audience enthusiastically responds to the lighting of the “Applause” and “On Air” signs. We’re hard-wired for this kind of entertainment too. 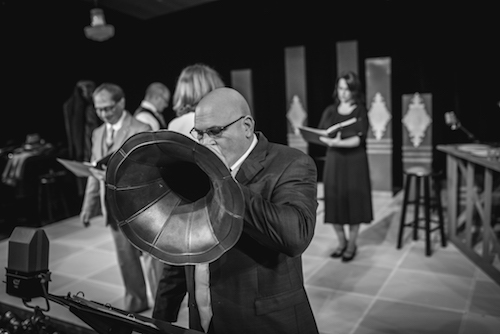 Because they are ‘in a radio studio,’ the entire cast is on stage throughout the play, either reading their parts into the microphones or preparing sound effects or ready to jump in to the middle of a jingle. It’s part of what transports you to this magical world. We are all concocting this make-believe together, and we are all rooting for the happy ending that we know is possible. 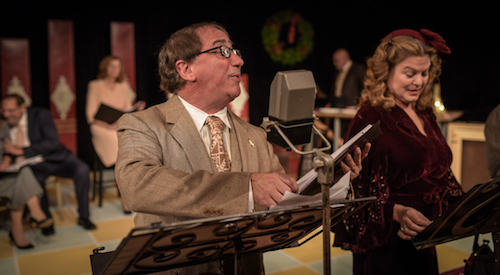 “A Christmas Carol: A Live Radio Play” continues at Center Stage at Southampton Cultural Center, 25 Pond Lane in Southampton. Dec. 1 at 7 p.m., Dec. 2 at 2, 5 & 7 p.m. and Dec. 3 at 2 and 5 p.m. Tickets are $25 for general admission and $15 for students, and are available by calling the box office at 631.287.4377 or online at www.scc-arts.org. An encore presentation will be held at the Peconic Landing Community Center, 1500 Brecknock Road in Greenport on Dec. 10 at 2 p.m. Admission to the Dec. 10 performance is free.